Before the much-maligned Chrysler k-car was birthed from the depths of the Chrysler Corporation, we had the Chrysler L-Platform. This new front wheel drive platform consisted of the Dodge Omni and Plymouth Horizon hatchbacks and Chrysler made almost one million of them. The Horizon and associated vehicles were seen as essentially disposable and they pretty much were. My dad cracked the engine block of not one but two Dodge Omnis. The disposable nature means that there really aren’t many Horizons or Omnis left anymore. That could be a good or bad thing depending on who you ask. Luckily, an eBay user in Florida is selling their 1986 Plymouth Horizon SE. Full disclosure: I adore the Horizon and if it wasn’t in Florida, I’d be on my way to buy it. This Horizon is in a wild two-tone paint which is betrayed by the 2.2-liter inline-four that graced most Chrysler models of this era. Earlier Horizons and Omnis had a Volkswagen sourced power plant. The Horizon also sports a recently rebuilt automatic transmission. Chrysler made transmissions from the era had all the longevity of potato salad sitting in the sun. Many cars of the era only had a five-digit odometer. The clock on this Horizon reads “31,163.” That could mean 131,163 or 231,163 miles. I have no idea and the seller doesn’t note it either. Other than that, the Horizon is in fairly good shape and is decked out in a truly garish red interior. 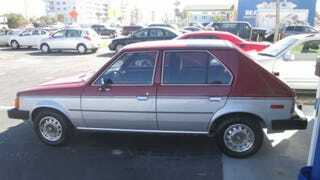 I really hope someone buy this Horizon and drives it forever or else I might have to. Full auction details can be found here.